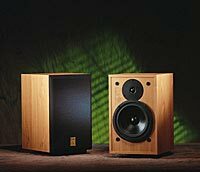 ideally suited for home HiFi of A/V set-ups. features to ensure your listening pleasure. Music There Are No Shortcuts”. Stand mounting/Bookshelf 2-way reflex design. Rounded edges on reflex port for lower distortion. High efficiency for ease of driving. Drivers arranged close to each other for better stereo image. 19 mm fabric dome tweeter ferrofluid cooled for high power handling. chassis and high flux magnetic system. High grade components in crossover for perfect match to drivers. eliminate structural resonances and colourations. Massive cloth grille to reduce baffle vibrations. Bi-wire option with 4 heavy gold plated connectors. Specifications and appearance subject to change for further improvement without notice.